Present Illness: This patient is a 64 year old African-American male with a history of coronary artery disease, congestive heart failure, and hypertension, who presents with complaints of right upper extremity numbness and difficulty with movements of the right hand and arm. He reports that over the five days prior to presentation he had experienced a gradual onset of right arm numbness. He had also developed similar sensation changes in the left arm, although to a much lesser degree than in the right arm. Two days prior to admission, he noted an abrupt onset of inability to move his right arm effectively. He describes this as "difficulty getting the arm to do what I want." His sister, also present, reports that he has been walking differently over the last two days as well. The patient states that he began having difficulty lifting his right leg when walking, earlier on the morning of his presentation to the Veterans Administration Medical Center in Houston. He also describes burning pain in the area of his lower back, and involving his buttocks, for about one week. Of note, the patient had been admitted four years previously, with difficulty walking, numbness in the legs, constipation, and urinary retention. On that occasion, he was diagnosed with transverse myelitis, but the cause was never determined. He was treated empirically with dexamethasone, with some improvement in his symptoms. Since that time, he has had persistent hyperesthesias in the legs, as well as urinary retention and impotence. A neurologic examination, documented two months prior to his current presentation, describes sensory loss to light touch, temperature, and pin prick sensation below the T9 level, with glove-like sensory loss in both hands to the wrist. At that time, vibration and proprioception were absent to the knees, but intact in the arms, and his strength was 5/5 throughout. His gait was mildly unsteady and slightly wide based, but he was able to heel, toe, and tandem walk. These findings were felt to represent no significant change from earlier evaluations. A recent MRI of the spine showed no change from an MRI scan several years earlier, with minimal T2 hyperintensity in the upper thoracic cord, and only mild degenerative joint disease in the cervical spine. Coronary artery disease, with myocardial infarction 1991. Catheterization and coronary angiography one year ago showed 71-95% stenosis of the proximal left anterior descending coronary artery. Congestive heart failure, following his MI, with a mural thrombus treated with coumadin, and a persistently low left ventricular ejection fraction (LVEF 25% on LVgram one year ago). History of transverse myelitis as above. Medications: Acetaminophen prn, Maalox prn, baclofen 10 mg q.am and 20 mg q.pm, beclomethasone inhaler - 2 puffs in each nostril b.i.d., calcium 250 mg / vitamin D 125 mg, one tab q.d., gabapentin 400 mg 2 q.am, 1 q. noon, and 1 q.pm, Isordil 10 mg t.i.d., lansoprazole 30 mg q.d., ranitidine 150 mg b.i.d., tamsulosin 0.4 mg q.d., warfarin 7.5 mg q.d. Social History: Married and lives with his wife, who is disabled. He has a 20 pack year history of tobacco, but quit 10 years ago. No history of alcohol or IV drug abuse. Family History: No history of neurologic disease in the family, including strokes, transverse myelitis, or neuropathy. Otherwise noncontributory. Review of Systems: As outlined above. He denies recent illness, chest pain, trauma, nausea, vomiting, diarrhea, bleeding, or significant recent respiratory symptoms. He denies recent weight loss. Erythematous, excoriated rash over the lumbar region. General: Well developed, well nourished African-American man lying in bed in no distress. Vital Signs: Weight: 218#, Height 71", Blood pressure: 146/106 mmHg, Respirations: 20/min., Temperature: 98.0 F, Pulse: 97/min. HEENT: No evidence of trauma, anicteric sclerae, conjunctivae clear/pink/moist, other mucous membranes moist, without rashes. Neck: Supple with no masses or thyromegaly. Jugular venous distention not observed. No bruits heard. Cardiovascular: Regular heart rate and rhythm, normal S1 and S2. No murmurs, rubs, or gallops. Abdomen: Obese, (+) bowel sounds, soft, mildly distended but non tender. No organomegaly noted. Extremities: No cyanosis, clubbing, or edema. Dorsalis pedis and posterior tibial pulses strong bilaterally. 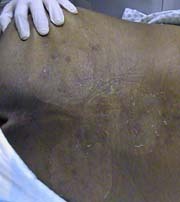 Skin: Erythematous, excoriated rash over the lumbar region, extending downward to the buttocks, more pronounced on the left, with a few scattered vesicles. Mental Status: Awake and alert, oriented to person, place, time and situation. Follows commands easily without hesitation. Speech: Clear with no dysarthria. Fluent speech with repetition and comprehension intact. Normal speed, volume, and prosody. Cranial Nerves: Visual fields full to confrontation. The right eye has slight ptosis that does not change over time. Pupils are equally reactive to light. Right pupil is 2 mm. Left pupil is 4 mm. Extraocular movements are intact. Sensation over the face is intact. Facial expression is symmetrical bilaterally. Hearing is grossly intact bilaterally. Palate elevates symmetrically. Sternocleidomastoid and trapezius strength are 5/5. Tongue protrudes in midline. Motor: 5/5 in all muscle groups on the left, with the exception of the iliopsoas which is 5-/5. The right arm shows 4-/5 strength throughout. The right iliopsoas is 4/5 strength, but strength in in other muscles of the right leg is 5/5. No atrophy or fasciculations were noted. Reflexes: 3+ (spread) from right patella and ankle jerk, all other tendon reflexes 2+. Tone: Increased in the lower extremities, right greater than left. Tone in the upper extremities is normal. Sensation: Loss of light touch/temperature and pinprick to approximately the T9 level on the right trunk and to the C4 level on the right. In the lower extremities, there is absent proprioception and vibration to the knees. In the left upper extremity, light touch, temperature and pinprick sensation are severely impaired in a glove distribution to the wrist, with diminished proprioception in small joints of the hand. In the right arm, proprioception is completely absent at the hand and wrist and diminished at the elbow. Light touch and pinprick are impaired throughout the right arm with worsening distally. Graphesthesia is impaired in the right hand. Thumb localization in space, and mirroring of movements of the contralateral side, are markedly impaired in the right upper extremity, and somewhat impaired in the left upper extremity. Coordination: Marked dysmetria is evident in the right arm, out of proportion to his weakness, with impaired rapid alternating movements. Loss of check of flexion movements is evident in the right arm. Gait: Wide based. He falls toward the right and requires assistance with walking. He cannot maintain a standing position without assistance, when his eyes are closed.